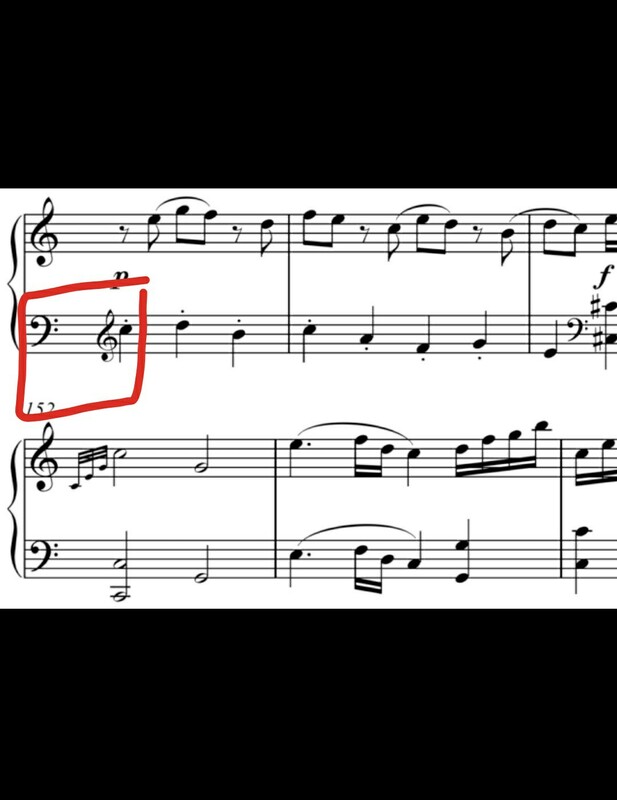 I came across this section in Mozart's piano sonata no. It shows a clef change at the start of the measure, but the bass clef is shown right before it. Why would this be needed if the measure uses the treble clef and does not use the bass clef? I'm sorry if the doubt seems amateurish, but it's the first time I'm coming across such a thing. So, here we have a clef change. The line before the line in question has the bottom staff in the bass clef, and in our first line here, the music begins with the treble clef. This change of clefs happens of on the first bar of the new line. So, why do we write a bass clef, only, only to have it immediately change to a treble clef? Why not just start the next line with a treble clef? Well, the reason for this is simple: cautionary clef. We want to make the clef change obvious to someone who is sight reading. When a pianist is sight reading, he or she often do not pays attention to details, such as the clef at the beginning of the line, or the key signature. The pianist often assumes it's the same clef, and the same key signature. So if we were to suddenly put a treble clef, it might confuse the pianist who is sight reading. By continuing the line with a bass clef, and putting the treble clef immediately after it, what we are signalling is this: "here is a clef change!" in the most obvious way possible, that is, by ignoring the fact it is on the first bar of the line and treating it like any other clef change. Of course, this is not necessary to pianists who practised the piece well in advance, they are neither benefited, nor hurt by this notation. But we want to be courteous to people who are sight reading. They need things to be really obvious. It would be more usual to have a (small) cautionary treble clef at the end of the previous stave, start the new one with a normal, full-size clef. You sometimes see it done the way shown in hand-written scores using pre-printed 'piano layout' manuscript paper. But the example looks like it's been prepared in Sibelius. It is actually quite hard to make Sibelius notate a clef change this way! And where's the first beat of the bar? This notation would make perfect sense if there was one beat of music in bass clef starting the bar. Perhaps noorav@ could give better details of where this was found? Not the answer you're looking for? Browse other questions tagged notation clefs engraving or ask your own question. Does a key signature remain the same after a clef change?